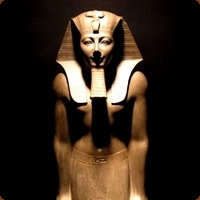 Pharaohs of Ancient Egypt: Pharaoh is a title used to describe the ancient Egyptian rulers of all periods. Meaning "Great House", it originally referred to the king's palace. Pharaoh is a title used to describe the ancient Egyptian rulers of all periods. Meaning "Great House", it originally referred to the king's palace, over time it became interchangeable with the traditional Egyptian word for king, nswt. There are several important King Lists that provide details of Ancient Egypt's Pharaohs, including The Palermo Stone, the Royal List of Abydos and the Royal Lists of Karnak and Saqqara as well as those from Manetho. The Kings listed start from the early Dynastic Period and Dynasty 1 and finishes with Dynasty 31 in the Late Period and covers the Old Kingdom, Middle Kingdom and New Kingdom kings. First King of the First Dynasty, his name means 'Fighting Hawk'. His Nebti name 'Men' appear side by side on ivory labels. Founded a temple to the Goddess Neith at Sais in the Delta. Founder of the capital city at Memphis. He reigned according to Manetho for 62 years. His tomb at Abydos (B 19-15) is the largest in the north-western section of the cemetery. Thought by many as being identical with king Menes, named in later sources as the founder of Egypt. Third King of the First Dynasty, his name means 'Horus Cobra'. Second King of the First Dynasty Horus Djer, whose Horus name means 'Horus who succours'. Djer (Manetho's Athothis) or Itit (his nomen) is said to have reigned for 57 years. Son of Aha and Hent (or Khenthap), built a palace at Memphis; whose wife was Queen Herneith. There are also indications of a possible military campaign against a country named Setjet, probably Palestine or Sinai. The Papyrus plant was the symbol of Upper Egypt. Lower Egypt was known as Ta-Mehu which means land of papyrus. The papyrus became the symbol of fertility and life itself. When intertwined with the plant emblem of Upper Egypt, the two symbolize the unification of the two lands.